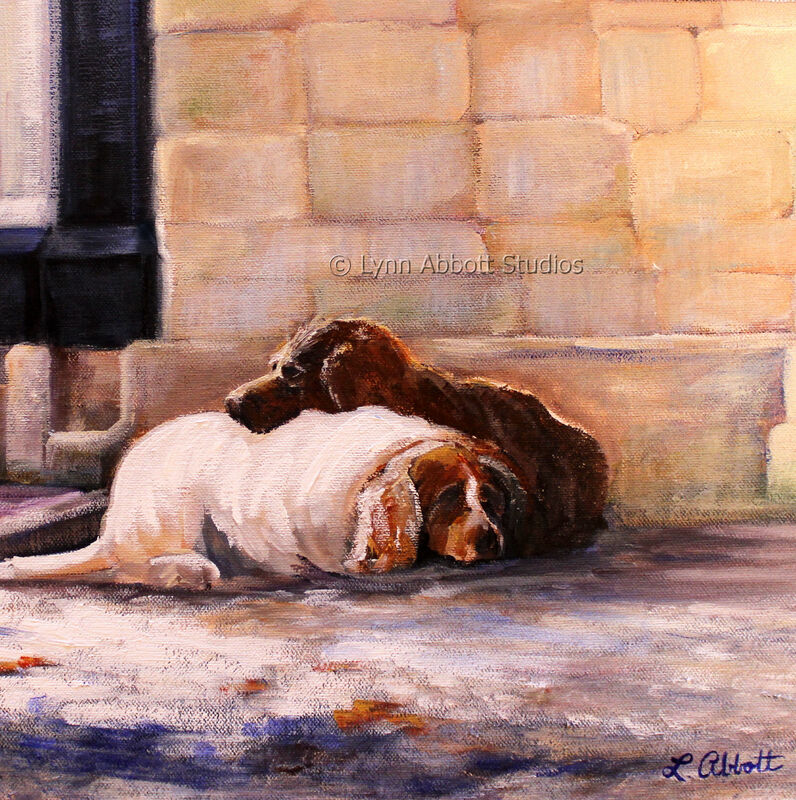 “I’ve Got Your Back,” © Lynn Abbott Studios. Used with Permission. Personally, I think he exaggerates just a tad. However, I do distinctly remember one woman and her tale. Since the summer’s day dawned humid and hot, I offered to take my then thirteen-year-old son and his best friend to the local water park. Fortunately for me, despite the crowds, a deeply sun tanned woman compassionately offered a seat at her table. Gratefully, I accepted her offer. After all, she explained that she would soon return home to walk her dogs. “I love dogs,” I said with a smile. And that smile predictably launched her story. My smile predictably launched her story. She added, “Guess he were lookin’ jes’ to be sure” and then, she paused for a moment. “How is he now?” I inquired. That’s right. More dogs. Turned out she had five dogs and two cats. All were rescues. Apparently, her compassionate nature made it impossible to ignore any pet in peril. Of course, when she first brought them home, the rescues were not a pretty sight; all were dirty, wet, unkempt and in desperate need of veterinary care. She wasn’t wealthy, but she gave what she little had–unconditional love and time. And in return, the dogs loved her, keeping vigil with her as she grieved. Thus formed the messy menagerie to which she offered both compassion and grace. They “had her back,” so to speak. Understandably, I was sorry when she finished her compelling story and prepared to leave. “Yup,” came the confident reply. I smiled because of course, we had only just met. Even so, the sun tanned lady had captivated me with her grace in those few short moments on a muggy afternoon. Despite the differences in our daily lives, our mutual love for dogs, and our similar journeys through grief bound our hearts together. Isn’t that just the way it is? The brokenhearted often become grace givers. And that’s the way it was. I met a grace giver that day. I can’t help but think that perhaps Jesus especially sought the outcasts because they often possess tender hearts. Or maybe, He simply has a soft spot for those drenched by rain, covered in mud. When He walked on terra firma, He touched those who needed healing–the emotionally raw, the rejected, the poor, the ill, the overlooked. Indeed, Jesus rescued a disparate and sometimes shaggy bunch. When I ponder this, I recall another grace giver’s story as recorded in 2 Samuel 9. Actually, 2 Samuel 9 is the final chapter of two friends–David and Jonathan–that we remember well. In fact, they were both brothers-in-law and best friends. Jonathan’s unselfish concern for David’s well-being remains an ideal for many. To warn David in order to save him from Saul’s murderous hate certainly undermined Jonathan’s own self-interest. After all, even if Jonathan’s risky loyalty to his father’s rival were never discovered, Jonathan’s kindness would promote David. And David’s life jeopardized Jonathan’s future as heir to Saul’s throne. Nevertheless, Jonathan warned David of Saul’s plans. When we read that David ran and escaped certain execution, we cheer and applaud Jonathan. And that, for most of us, is where the story ends. However, Jonathan’s loyalty continued to reverberate throughout David’s life. 2 Samuel 9 reveals the ultimate, Old Testament, “pay it forward” story. After years of running, refusing to pursue revenge, and offering grace again and again to Saul, David finally ascended to the throne. Grief, however, overshadowed his coronation joy. Jonathan had died in battle against the Philistines. Jonathan, the beloved friend who had saved David’s life, was not there to celebrate David’s crown. While David longed to repay Jonathan, Jonathan was out of reach. Enter Jonathan’s son: the broken and lame Mephibosheth. Brought before David, he likely feared for his life. He knew his very existence threatened the Davidic throne, and since he was disabled, Mephibosheth lacked bargaining power. Yet, David paid grace forward. For Jonathan’s sake, Mephibosheth was not executed as an enemy of the state. In fact, David returned to Jonathan’s heir the lands that had belonged to Saul’s house. Then, David went the “extra mile” and invited Mephibosheth to dine daily at the palace. No harm would ever come to Jonathan’s son. David had his back. Mephibosheth had not personally earned David’s kindness. Yet, for Jonathan’s sake, David honored Mephibosheth, an outcast and potential enemy. Evidently, grace begats grace. Those who receive great mercy frequently wish to pass it on to others. And I am reminded…despite my past, active attempts to usurp God’s sovereignty in my life, our Shepherd-King gives infinite grace. Although you and I were once cast out, once drenched in rain, once covered in mud and far off–Christ brought us near. He has placed us in His family which, in fact, turns out to be a vast menagerie of rescues brought together by His unfailing love. To be honest, on most days, I’m simply a messy rescue learning to love and to walk alongside Abba’s other rescues. Yet, because of Abba’s overwhelming and never-ending compassion, I long to become a grace giver. “I can’t help but think that perhaps Jesus especially sought the outcasts because they often possess tender hearts. Or maybe, He simply has a soft spot for those drenched by rain, covered in mud.” Beautifully written, Lynn. Thank you, David! That means the world to me coming from you, such an incredibly talented and accomplished writer! God bless you big time, my friend! I think that if Jesus said we are taking care of him when we take care of society’s less thans, it is something we should be serious about. We should always try to have eyes that see God’s image in others. Thank you so much, Karen! It means a great deal to me to know that my post resonated with you. I respect you so much! Your posts encourage me! To answer your question about the art, yes. I created the painting. 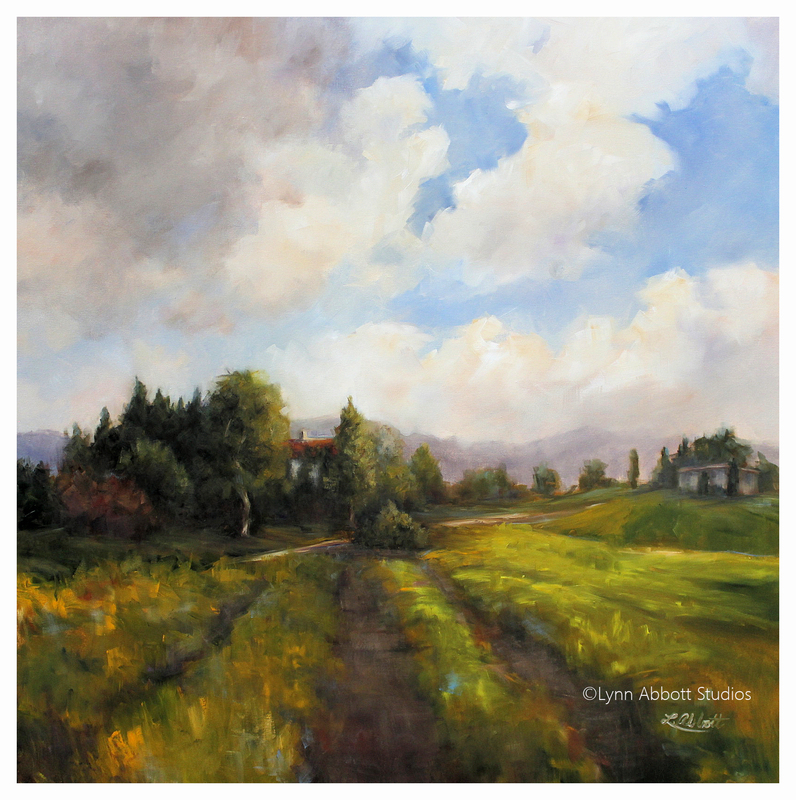 All of the paintings on my blog are mine. 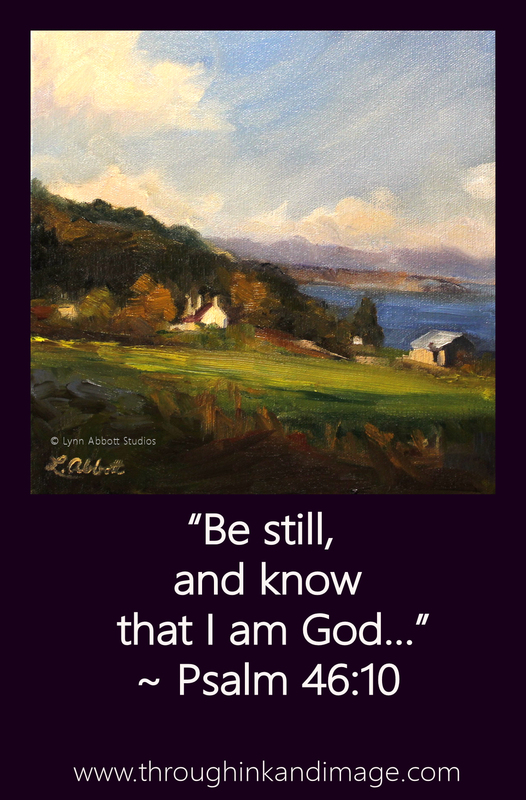 I started the blog because my best friend from high school encouraged me to write about the spiritual inspiration for my paintings. Thank you so much for noticing and for your thoughtful encouragement! God bless you and yours greatly! Thank you, Lynn! That was beautiful! So encouraging! Lynn, always my pleasure! I found myself identifying with part of what you wrote about broken people and how God uses them. Oh, I’m sure we all relate to that, dear Sue! God is so gracious to not only redeem us but to also give us a significant role in His plan. You have a beautiful ministry, Sue! Blessed to know you! Hugs! Only by God’s grace, Lynn. All glory to God! Yes, God is sooooo good! His grace is amazing! Amen! Sweet post. You said it all so well. I love the picture of the dogs too, relaxing and watching each others backs. Oh my goodness, Lynn! If we were neighbors, seriously, the chats we would have 🙂 I love how this woman shared something tragic and yet beautiful at the same time. I remember David’s care over his friend, and it was gracious of him to help the family. Thank you for sharing this beautiful art, and the stories connected to it. You betcha, T.R.! I sooooo wish we were neighbors! Perhaps, one day, we will be if your husband gets stationed in the Northern Virginia area. I hope and pray so. You are truly a kindred spirit, and we certainly would be able to share a lot! Love and hugs! 🙂 I’m thankful he is out, and I’ve seen God’s hand at work. I still haven’t made any friends here or found a church, but God has shown me He’s given me a church through the body of believers here, something I never expected before, and He’s given me amazing friends and people to connect to. like yourself ❤ I'm rambling at this point, but I wouldn't be surprised if God blessed us with meeting at some point. Oh, I’m sure you are relieved as he is definitely now out of potentially very dangerous postings. I will pray for your adjustment to your new area… it takes so much time to settle in… moving is tough. We’ve moved a lot over the years and it never gets any easier for me. You completely understand that having been a military wife. I do hope we will have an opportunity to meet! You are a treasure! Hugs! Oh, Natalie! YOU are a grace-giver. Each of your posts encourages and inspires… each of your posts lifts my spirit. I’m truly grateful for you! God bless you beyond all that you can imagine, my wonderful friend! ❤ and huge hugs! Oh, hello, Gail! I’m so delighted that you took time from your busy life to visit my blog. It means the world to me! And that you should spend a little time here leaves me speechless with gratitude…thank you for your kind words and encouragement. You made my day! Loved this post! Couldn’t leave it incomplete. So beautifully you described Abba’s love. Thank you! Hi Lynn, excellent insights (as always) and as luck would have it, something I was thinking about myself. Jesus knew, He knew what had happened on the inside, in our minds and in our spirit, He understood, with insight that only one who created us could. That’s why He could give us His peace, something intangible, yet highly valued, because that is where our core is, in our spirit and minds. Our mind can be renewed but our spirit is designed to be at one with Him. That’s why those chance meetings with someone who displays the attributes of God grab us, because our spirit knows. That one fact alone draws us to Him and it is a witnesses to who He is. And this is how our Father in Heaven is also. That’s where the peace comes from, we are home, with Him, He has our back and we are at one with Him and it is so good. Blessings! Isn’t that amazing, Bruce, how God speaks to His children about similar themes? I love that! And I so appreciate the wise thoughts that you have shared here. Yes, God does know and understand our heart fully, and as you suggest, in our relationship with Him, our spirits grow more and more at one with His. And then, when we meet someone who also knows Him, our spirits recognize family. And beyond all doubt, Our Savior has our backs. Beautiful applications in your thoughtful comment, Bruce! Thank you! It is True as you shared Lynn, those who have suffered and have Love in their Hearts Understand and care Compassionately for those who suffer too but some become bitter and resentful even blaming God for their suffering but this is mostly through wrong understanding or teaching. We all need to have Love, acceptance, support, approval, to be needed and to be encouraged, even in our yuky times. How sad if God turned us away because He felt our need was not that important or we should handle it ourselves or we were just feeling sorry for ourselves. Yes modem Secular Physiology would say your a Rescuer and so am I and that we should have boundaries to keep others away. I’m so thankful God rescued me and He did so by those who cared enough to listen to me, give Godly advice, pick me up when I fell down, warn me when I was in danger because of my sinning, cried with me when I was hurting, gave me hug and never in anyway pushed me away, my problem became their problem until I could move on in Victory, they didn’t create their own boundaries to push and keep me away and today over 30 years later we are still friends in the Lord together. There is a saying “Laugh and the World Laughs with you Cry and you Cry alone” but what does Jesus tell us…. Matthew 11:28 – 30 Come unto me, all ye that labour and are heavy laden and I will give you rest. Take my yoke upon you and learn of me for I am meek and lowly in heart and ye shall find rest unto your souls. For my yoke is easy and my burden is light. 2 Corinthians 1:3-5 Blessed be God even The Father of our Lord Jesus Christ, The Father of Mercies and the God of all Comfort, Who Comforteth us in all our tribulation that we may be able to Comfort them which are in any trouble by the Comfort wherewith we ourselves are Comforted of God. For as the sufferings of Christ abound in us so our Consolation also aboundeth by Christ. What a beautiful story to start the morning! We should all be such grace givers. That is why we are here – to touch one another for Christ. I am so encouraged from reading this. Thank you for listening and sharing. And you are truly a “grace giver,” Pete! Your psalms touch the heart and lift the spirit! I find joy, comfort and peace in each of your verses. I’m so grateful to have found your blog. And I’m extremely thankful for your kind encouragement here today. God bless you greatly, my talented friend! Thanks for you kind words, Lynn! Vincent, you are so thoughtful. Thank you and thank you again and again! I’m so honored that you would reblog this post! Yes, my feelings exactly, Vincent! 🙂 Thank you again! Ok, haven’t even finished my first cup of coffee this morning and I’ve got tears in my eyes. The painting doesn’t help either—it is a heart tugging image Lynn—as I too love animals—our two cats are rescues and one day, we will make way for a dog—we’ve had dogs but Gregory is really not a pet person so many of them don’t last as something will go wrong and he just can’t deal with it—but the cats have taught him really how to be a good pet owner as they both came to us in a bad way, especially Percy…but that’s a long story for another day….. Your tale is heart wrenching and heart warming all rolled into one—as I know animals can and will grieve themselves to death when they lose a “loved” one…. I too appreciate that gift!!! Ok more coffee as I wipe my eyes…. well Lynn—now with your kind words, I’m crying again…..we had quite a day today, which I’ll email you more later, but we had to attend an auction of Gregory’s parent’s home today–all the contents—it’s a looooong story but Gregory and his younger sister (younger is relevant as he’s 68, she’s 67 and the older sister is 69)—the older sister has contested the entire estate—we’re going on a two year in this ordeal—so finally there was an auction—with all proceeds just going into the lawyers acct as this will probably go to court before its said and done —-I was an emotional wreck–more so than I thought I would—-so your kind words have been such a needed balm to my soul!!!! Thanks Lynn–I’ll email and give you the back story—but theirs is a family a great dysfunction that Gregory and his younger sister have overcome—yet the dysfunction has held on…I’ve just hated it so badly for Gregory who has just always tried to do the right thing—and we know that those who often do the right thing will finish frustratingly last—-by world standards—and it is beyond this world which matters—I keep reminding him of that! Dearest Julie… I look forward to your email. Am praying for all of you in this situation. Please forgive me for not having commented on your past several posts yet… I didn’t wish to rush through reading your beautiful posts… I love to savor them with a cup of hot tea. Unfortunately these past several days I have been scrambling (it is the first of the month and everything at the galleries has to be updated. First week of the month is always crazy). Anyway, I’m on my way over soon. Finally have a moment to catch my breath and to read one of my all-time favorite writer’s blog… you, of course. 😉 Love and huge hugs! Thank you, Lynn – truly beautifully profound. Well, hello, Naomi! What a delight to meet you here! Thank you for your kind comment. It means a lot to me. I’m looking forward to visiting your blog soon! God has gifted you with special grace, the right words and the right colors… You are very good! God bless you Sister! Thank you with all my heart, Silvia! Your passion for God, His people and ministry is such an inspiration to me! “Those who receive great mercy frequently wish to pass it on to others.” ❤ This was such a beautiful read, Lynn! 🙂 Thanks for sharing! Thank you for taking time to stop by, dear Maggie! It always means the world to me when you visit! You are such an inspiration to all of us in the blogging community! Love and hugs! Oh, I am truly honored. Thank YOU! ❤ ❤ and bunches of hugs! Hello, Dave! Aww, thank you for your remarks about my writing! You are truly kind. Thank you also for your thoughtful encouragement. To be honest, I can’t imagine viewing myself as anything but a messy rescue. After all, I’d simply set myself and others up for disappointment ;-D God bless you big time, my friend! Oh Lynn, I love this! The dog painting is adorable, and the woman’s story brought tears to my eyes. 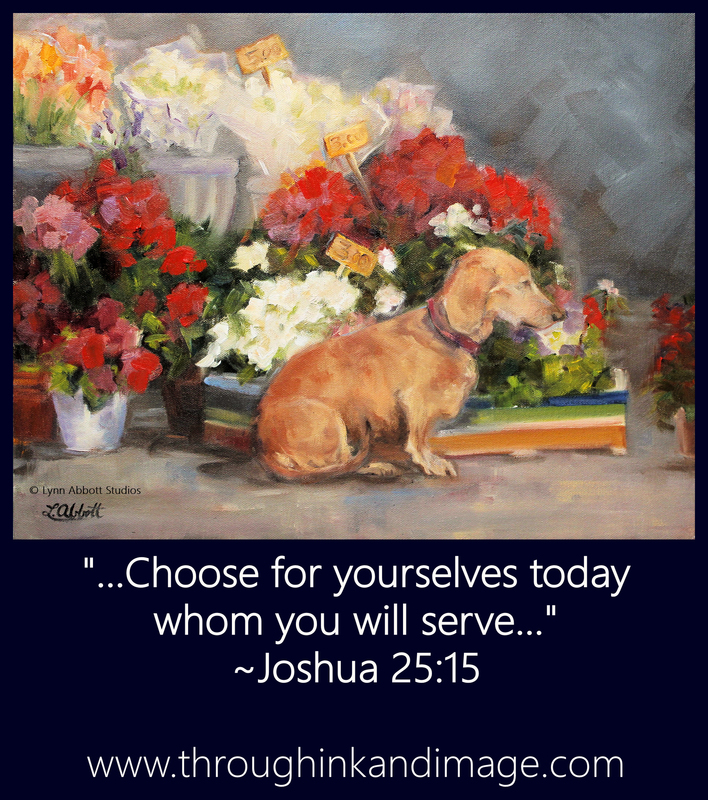 And the way you used her dog rescues as an analogy of Jesus’ rescue of us messy ones – Wow! You definitely are a grace giver! Not only in listening compassionately to that woman, but in spreading encouragement with your paintings and your writing. Thank you for comforting my heart today! Love and hugs! “a menagerie of rescues brought together by His unfailing love” ~I love this! 2 Corinthians 1:3-5 “Praise be to the God and Father of our Lord Jesus Christ, the Father of compassion and the God of all comfort, who comforts us in all our troubles, so that we can comfort those in any trouble with the comfort we ourselves receive from God. For just as we share abundantly in the sufferings of Christ, so also our comfort abounds through Christ. That verse just kept rolling around in my head the whole time I read your beautiful post! Hope you have had a wonderful Lord’s Day today! Thank you, dear Linda! Worship today was beautiful, and the message about reaching out to others… so I truly felt that God has been confirming His words to me again and again. And that is true joy! Thank you for your kind and thoughtful words! Hugs! I love that old hymn, Anthony. So beautiful. I wish I could sit under your teaching. Your writing speaks to me, and I bet that I would love your teaching. Also, your wife sounds absolutely lovely. I’m sure she and I would be good friends! I will pray for your message tomorrow. God bless you big time, my godly friend! 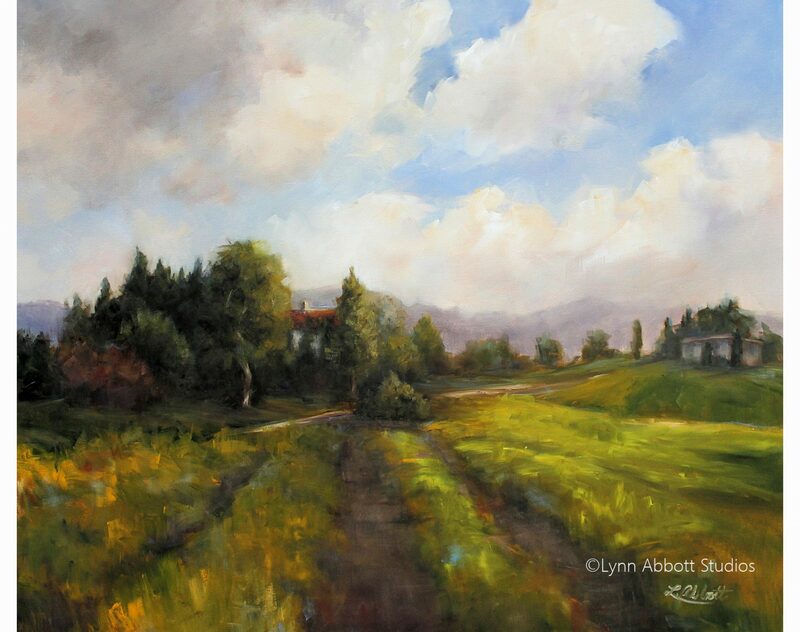 I was amazed to find out that Lynn Abbott didn’t just post some great artwork with her writing, but her great writing included fantastic artwork she does herself! This particular post was a blessing to me, especially in the light of what I plan to cover in church tomorrow morning. How about going on over to “Through Ink & Image” and saying “hello” for me? I’m sure you’ll be blessed, and she would appreciate it, too. Anthony, “thank you” seems so unequal to your extraordinary kindness, and your thoughtful words! You are truly an encourager and absolutely a “grace giver.” I’m blessed to have met you through your amazing blog! God bless you and your ministry in 2018 beyond all that you could ask! Oh, Maggie… you are beyond doubt a wonderfully kind and encouraging friend! Love and huge hugs! It is a rare gift to be open to the needs of others and genuinely interested in them. You certainly seem to have that gift, and I am working on developing it! Oh, Meredith… I think you have the gift. You are just humble. But you have been such an encouragement to me, and many who follow your blog! Hugs! Thank you with all my heart, Ian! You are a wonderful new friend and I’m so thankful for your encouragement and grace! God bless you big time as you have so blessed me! I like it when you say “To be honest, on most days, I’m simply a messy rescue learning to love and to walk alongside Abba’s other rescues. Yet, because of Abba’s overwhelming and never-ending compassion, I long to become a grace giver.” I find that what it is like with most people who are Christians, we learning to be more like-Christ even though we are not perfect and we long to reach out to others to show them Christ’s everlasting love. I know for myself, this is something that I want to do, but sometimes am guilty for not always doing this. That is where we have to move forward from that and learn how to long to be like Christ and learn our mistakes. Well, hello, Terry! I’m so delighted to meet you! Thank you so much for stopping by and for your thoughtful comment! You speak with such wisdom. I am so encouraged by your words as I know others will be as well! I’m looking forward to visiting your blog. So glad you came because I love meeting new friends. God bless you greatly. 🙂 I’m glad too! Aww, thank you. You’re a wonderful person and I always enjoy our chats as well. 😀 I’m glad your new year has been amazing so far! Aww, thank you so much, Diana! ❤ and hugs! Oh, I’m so glad… Thank you, Jeff! It means so much to me that you stop by and leave words of encouragement and wisdom here. God bless you greatly as you have blessed me! I love this dog painting. Followed you.